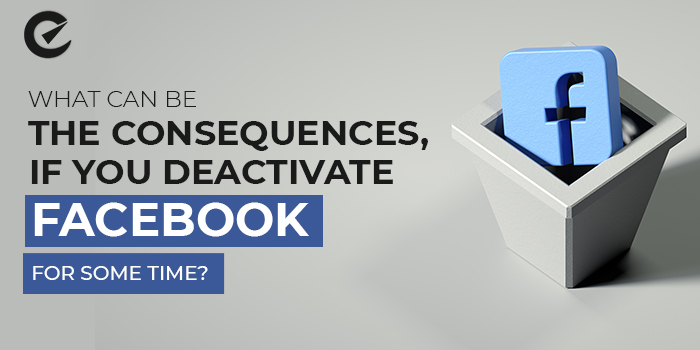 What can be the consequences, if you deactivate Facebook for some time? With the immense popularity of Facebook, at present there are more than 2 billion audiences on Facebook. They are active communicators who post blogs and photos almost every day and its popularity is increasing even more with every passing day. The purpose of using Facebook is quite clear for the masses. They want to stay connected with their near and dear ones and also to read all kinds of news. Thus, the audience is always updated with news and information of all kinds which can wants to follow. What if, all of a sudden someone asks you to deactivate your Facebook profile? Well, very recently researchers analyzed the consequences that can occur, if, suddenly someone has to deactivate their Facebook account. Researcher of New York University and Stanford University found out, if, Facebook was deactivated just for 30 days then it changed the attitude of the people and their mind. Restricting people from viewing Facebook, made then watch TV and spend more time with friends and family members. Although their knowledge on current affairs reduced, there has been a noteworthy improvement in their personal life making them happier in their lives. The report also stated that, even after completion of the experiment people started spending less time on the social networking platform and it also unfettered an average of one hour each day for the participants. The researchers also clinched that the disadvantage of using Facebook is very less and there is very little doubt, that Facebook gives more benefit to its users. According to the participants Facebook give them entertainment, helps them with social bonding and it fulfills the underlying need. The study also showed that there has been mental improvements among those people, who were restricted from using Facebook. It also suggests that people are using more time on Facebook than it is actually required. The Researchers also suggested neither they are against Facebook nor do they support Facebook. It is only they wanted to experiment how much we are influenced by Facebook. The study was based on 2844 Facebook users, who are young, educated and spend more than 15 minutes on Facebook every day. Facebook has always been clear about its vision. Their sole purpose of Facebook is, to create meaningful connections and to provide tools, for to user to have better experience. Although the researcher found that people responded differently once they took longer break from Facebook, the factor might also be dependent on the kind of person on which the experiment was conducted. Previous PostPrevious Drones are revolutionizing the world. But how? Next PostNext Beware of cryptojacking. Learn how to prevent it.